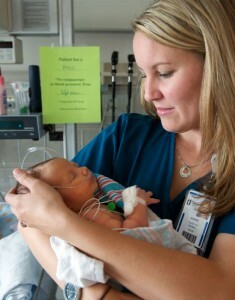 Kerri Clark at work in the PICU. College tuition in Ohio costs more than $10,000 on average. For years, Akron Children’s Hospital has helped employees overcome this financial hurdle through its educational assistance program. For instance, full-time and part-time employees are eligible for up to $5,250 in educational assistance benefits each year. “Children’s has long recognized that professional development and participation in formal education programs are critically important to the professional growth of our staff,” said Richard Biering, Akron Children’s director of Training and Development. But after educational assistance caps out − and you want to continue your education − how do you get help paying for this? As Kerri Clark, a pediatric intensive care unit nurse and full-time student, recently discovered, there are other ways to get help paying for school. The mother of two recently learned of a scholarship available to PICU nurses. After writing an essay, applying and interviewing for the position, Clark was awarded the McKenzie Rose Garretson Scholarship. For information about career opportunities at Akron Children’s Hospital, check out our current job postings.